RealDose Weight Loss Formula No. 1 is produced in America by RealDose Nutrition. The company manufactures several other health supplements and appears to work closely with a team of medical professionals. The pills are marketed with claims that they “remove fat burning hormonal barriers” and convert food into energy instead of fat. The science of this seems a little shaky, but the company is offering customers a 365-day money back guarantee. That’s very impressive and RealDose offer customers further support via their exclusive online community. Advisers are also available, via email and telephone, to provide additional help. According to RealDose, Weight Loss Formula no. 1 contains ingredients that work together to balance the hormones, calm the mind, and suppress the appetite. They also state the formulation is clinically proven to help the body convert more food into energy instead of storing excess calories as fat. However, although some of the ingredients have clinically proven weight loss enhancing abilities, some of them do not and RealDose fails to provide any information to support their claim that this particular formulation has been proven to work. LOWAT Proprietary Blend (300mg): A proprietary blend of dolichos biflorus seed extract and betel leaf extract. The results of one clinical trial suggest LOWAT is “safe and effective for weight management”, but the amount of weight loss it provided is unclear. Siberian rhodiola rosea root extract (133.33mg): Also called golden root, rhodiola rosea is used as an anti-depressant in Russia. RealDose say the extract can reduce body fat by lowering cortisol levels. We could find no evidence to support this claim, but one study shows it may be good for fighting fatigue. Svetol (133.33mg): A patented-protected form of green coffee bean extract. The Svetol website references a study that suggests it has the ability to deliver a weight loss of 11 pounds per 8 weeks of use. Bioperine (5mg): A standardized black pepper extract. It provides a compound (piperine) that can increase nutrient absorption by up to 2000%. How to Use – One capsule is required, with water, three times per day. The doses need to be taken 30 minutes before a meal. A sensible diet is required for best results. The RealDose website has a testimonials page that contains a lot of statements made by people who say RealDose helped speed up their weight loss. Unfortunately most of the people making the testimonials fail to say which product they were using. The RealDose Weight Loss Formula No. 1 sales page has a section where customers can leave reviews. Over 400 customers have done so. Many people say the product works, but there are plenty who say it does not. 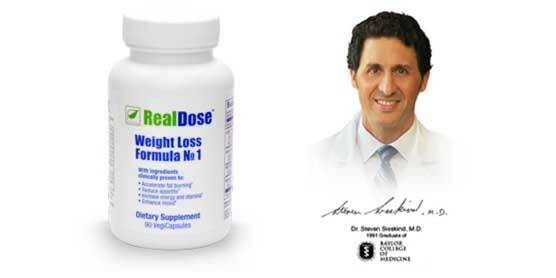 RealDose Weight Loss Formula No. 1 is a 100% vegan-friendly weight loss product. It is also suitable for dieters who need a gluten-free weight loss option. RealDose say side effects are unlikely, but point out the formulation is not intended for women who are pregnant or nursing a child. People who have existing health problems are advised to seek medical advice prior to commencing supplementation. The same advice is offered to individuals who are using medication. Weight Loss Formula No. 1 is exclusive to the RealDose website and the price is $67 per (90 capsule) bottle. Customers who want to get a little more bang for the buck can do so by taking advantage of bulk-buy discounts. It is also possible to buy RealDose Weight Loss Formula No. 1 via the RealDose auto-ship program. Customers who do so only pay $53.60 per bottle. RealDose Weight Loss Formula No. 1 comes with a 365-day money back guarantee. We have mixed feelings about this product. On the one hand, RealDose appear to be trying to blind consumers with science and could be accused of making Formula no. 1 sound more complicated than it is. On the other hand, they are offering a very impressive money back guarantee, so it would appear customers have nothing to lose if they decide to give the product a go. The best ingredient appears to be Svetol green coffee bean extract. It has proven abilities and the fact that it has been blended with Bioperine should ensure it delivers maximum benefits. For this reason, we feel RealDose Weight Loss Formula No. 1 should be capable of enabling faster weight loss. But it is a little more expensive than many competing products, some of which have more to offer. If you want to lose weight faster, it’s a good option, but it is far from being the best and will never be “no. 1”. 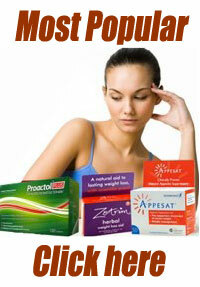 We review dozens of weight loss pills every year and rate and rank products accordingly. For the last two years there has been one standout product – PhenQ. 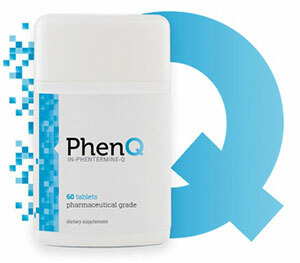 PhenQ can burn and block fat as well as suppress appetite – It is very popular in many countries including Australia, United States and the UK.